Endorsed by Cambridge Assessment International Education to support the full syllabus for examination from 2020. The Question & Workbooks and Study and Revision Guides have not been through the Cambridge International endorsement process, nor has the material on MEI's Integral platform. To keep up to date sign up to our Cambridge Secondary e-updates. Five Student Books ensure thorough coverage of the revised Cambridge International AS & A Level Mathematics syllabus, and are accompanied by a Workbook, and Student and Whiteboard eTextbooks. 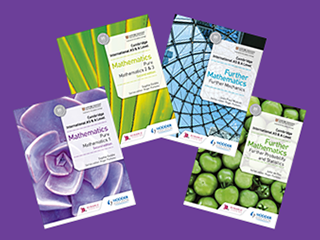 Four Student Books fully cover of the revised Cambridge International AS & A Level Further Mathematics syllabus, and are also available as Student and Whiteboard eTextbook editions. Breakdown the changes in the revised syllabuses for first examination from 2020 with comprehensive syallbus matching grids for each of our books, which also show you how we've adapted our resources accordingly. Download a sample chapter from the Student Books. Our Student Books are also available in two digital formats - Student eTextbooks and Whiteboard eTextbooks. Our eTextbooks link directly to digital resources from MEI's Integral platform - these include self-marking tests and assessments, classroom activities and more! Reinforce learning and deepen understanding through practice; an ideal course companion or homework book for use throughout the course.